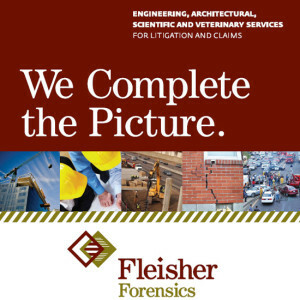 Founded by David H. Fleisher, P.E., Fleisher Forensics has handled a diverse set of forensic evaluations distinguishing itself across the nation. We regularly work with attorneys, law firms, insurance companies, municipalities, engineering and architectural firms, and industry to evaluate litigation and claims matters. The backgrounds of our experts include engineering, architectural, scientific and veterinary disciplines with a core team comprised of architects, chemists, and civil, structural, mechanical, metallurgical and materials engineers. Specialized areas include construction, premises, products, and professional liability with expertise in construction codes, safety, standards, flooring, testing, quality control, research and product development. Fleisher takes pride in it’s long-standing relationships with a multitude of plaintiff and defense attorneys, insurance companies and government organizations. Our clients demand comprehensive and clear analysis, reporting, presentation and expert witnessing. You can be assured that you are working with competent professionals with deep experience and credibility. If you are looking for clarity and understanding, we can help!